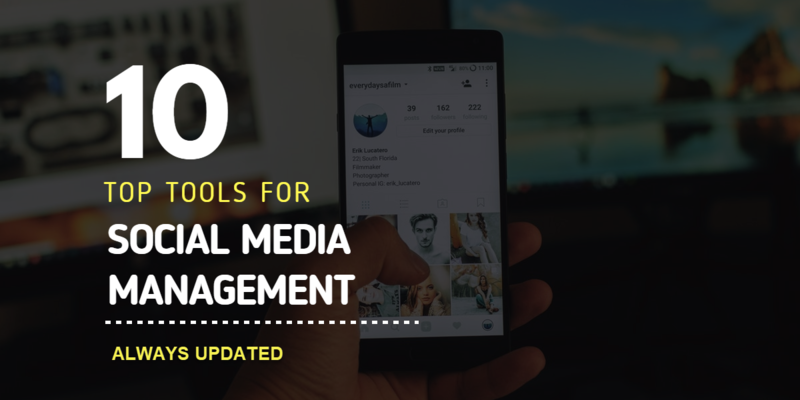 So we made a consistently updated list of the top 10 social media management tools for 2019. There are three major features that a good social media management tool should always have – publishing and RSS integration, social engagement, and great analytics reporting. Those three areas are exactly what makes a comprehensive social media management platform. eClincher is a comprehensive platform but yet simple to use. It has all the essential features a social media management tool should have plus unique ones – auto posting with smart queues, social inbox, RSS feeds integration and auto posting, suggested content plus curation, influencer discovery, custom analytics reports, Canva integration, media asset management, free image library, URL shorteners, and more. Let’s look at a few of those. Publishing & RSS – eClincher has a robust system for publishing content. One of the most favorite feature is the Auto Post with Queues which allows users to automatically publish hundreds of posts for the next X number of months, with just a few clicks. eClincher offers the ability to recycle content as well as publish it once and remove it from the queue. 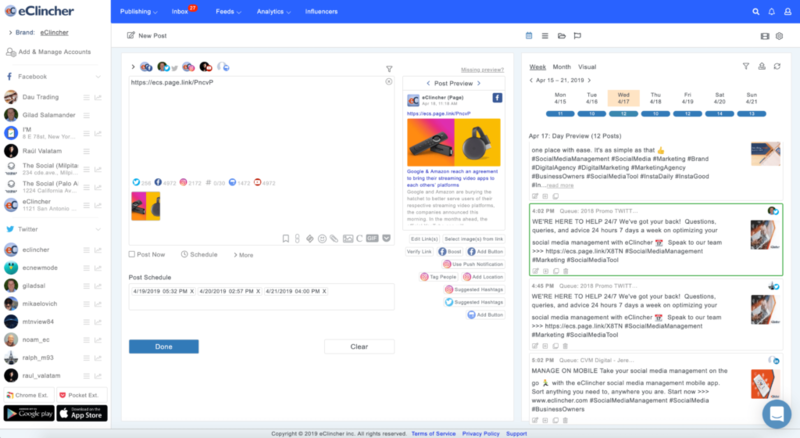 There is also the RSS integration which allows users to automatically publish every single blog post (their own or their favorite industry blogs) onto their social media profiles. 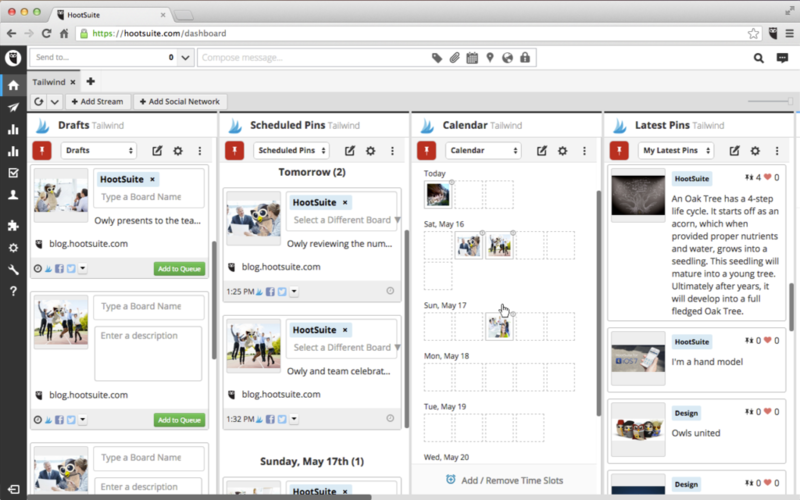 eClincher also offers a great scheduling tool with visual calendar, auto link shortening, free images, and animated gifs, and video publishing support. Suggested Content allows you to use keywords or categories to quickly find articles to share with your audience. Social Engagement – eClincher offers a Social Inbox which lets users manage all their social media engagement and interactions in one place. We’re talking about tweets, DMs, mentions, comments, likes, shares, new followers, even YouTube and Facebook Ad comments. There are also social listening and monitoring features to help you monitor your brand or other mentions, interact with followers, and start new conversations. Influencer Search – eClincher offers users the ability to search for influencers on Twitter, view them by topic, ranking, location, and interact with them. Clients Management Support – if you are an agency or have a several clients that you manage, then this feature is perfect for you. eClincher offers a dedicated workplace for each client, with a separate calendar, inbox, analytics, and assigned team members, so you won’t ever get confused and will be able to keep everything organized and clean. In addtion, eClincher offers fully customized white label analytics reports, inbox work flow for teams, and internal / external post approval workflow. Publishing & RSS – Buffer has the basic publishing features such as scheduling and adding posts to a queue but it is not made for evergreen posts. Meaning, it will not let you upload hundreds of posts and then recycle them, or publish them on your social media until you tell it to stop. It does have the RSS feed that helps you publish posts from blogs. Social Engagement – Buffer just launched a new product called Reply which is similar to eClincher’s Social Inbox but it only supports Facebook, Twitter and Instagram comments. it is also way more expensive. It costs $415/month for 3 user/15 profiles, in addition to the basic Buffer pricing. Clients Management Support – Sprout has the basic team features but not much else in this category. Publishing & RSS – Hootsuite has bulk scheduling which allows you to upload several posts at a time, but it does not have the Auto Post feature that recycles the content for you. It has a cool feature that allows you to create social sweepstakes or contests on social media. It also has RSS integrations just like eClincher. 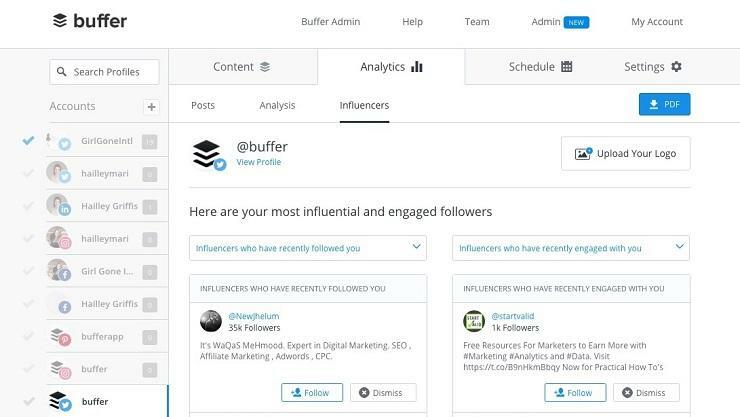 Influencer Search – Hootsuite does not offer the ability to find influencers. Scheduling & RSS – Sendible has a Smart Queue feature which is similar to eClincher’s Auto Post in that it helps you put your favorite posts on repeat. It also has a smart recommendation system that recommends the top posts for you. 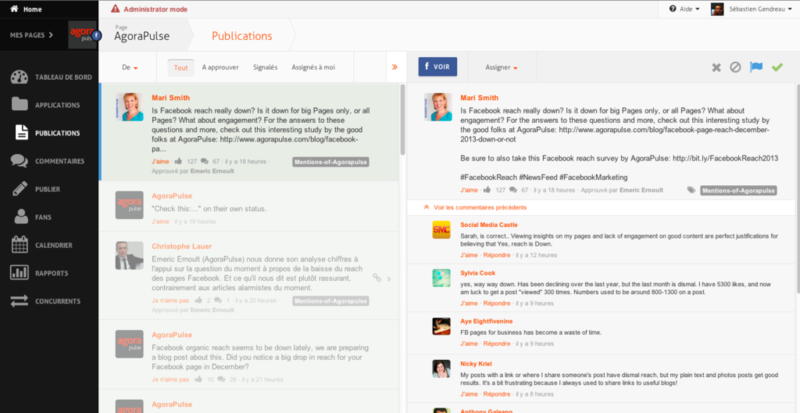 Social Engagement – Sendible does have the Social Inbox feature and it has team member features just like eClincher’s. Sendible also has social listening features that allow the user to monitor different keywords and see what is being said about their brand. Influencer Search – Sendible does not have an influencer search feature but it does have a CRM that allows you to treat your social interactions and the people that you interact with like leads. It shows you the entire conversation history and different information about them. Sendible’s pricing is calculated per number of services. A service is a one-way interaction with any social media network. For example: posting and streaming to 1 Facebook page would count as 2 services. 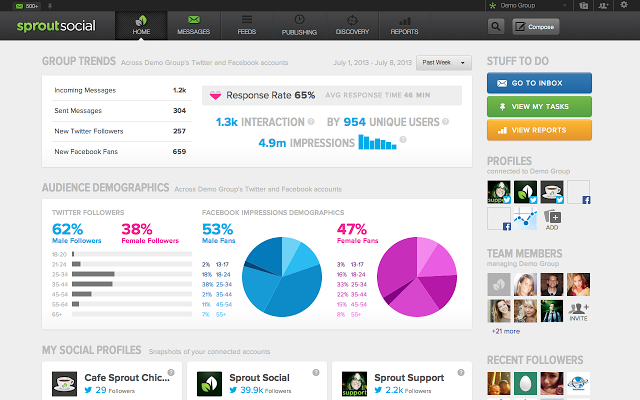 Social Engagement – Social Pilot does not have the Social Inbox feature or any social monitoring or listening features. It does have content feeds where you can browse at different content and get ideas, but not engage with other social media enthusiasts (or your own followers). Influencer Search – Social Pilot does not have any influencer features. Agora Pulse has a variety of features that are really useful – social engagement, publishing, listening, reports, and team collaboration. Scheduling & RSS – Agora Pulse does have the Auto Post feature where you can queue evergreen posts (indefinitely). You can also put labels on your content that allow you to easily retrieve and analyze each post (or an entire category of posts). 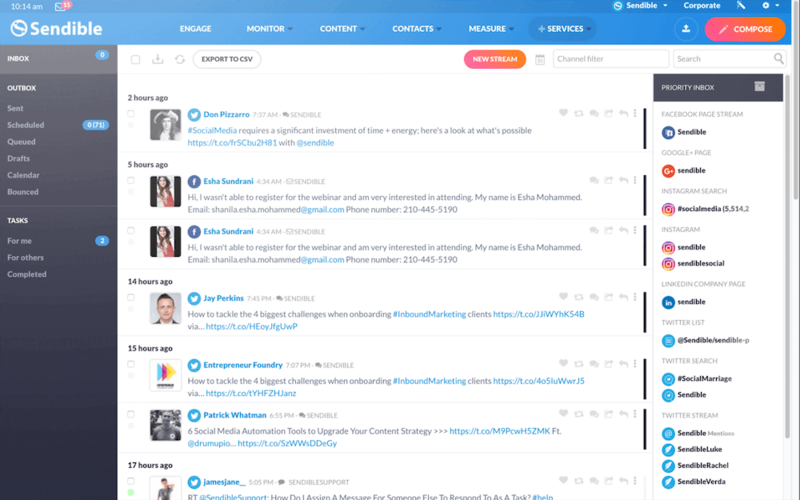 Social Engagement – Agora Pulse does have the Social Inbox feature where you can interact with every follower and message in one place. You can also view every single profile just like you can with eClincher. It does also have social monitoring and keyword searches. 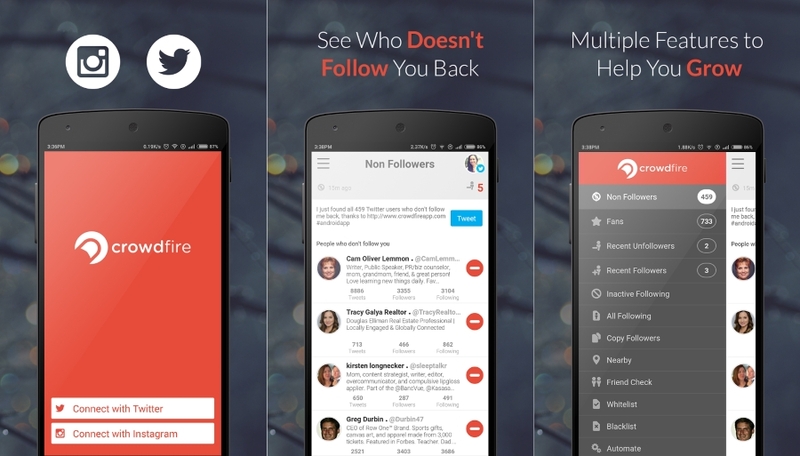 Influencer Search – Agora Pulse does not have any influencer features. Clients Management Support – Agora Pulse has the basic team sharing features plus content approval from clients and the ability to assign messages to clients, which is pretty cool. 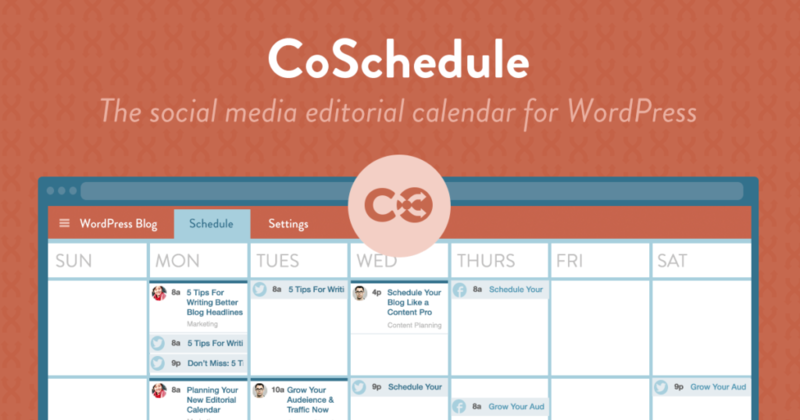 Social Engagement – CoSchedule does not have any social engagement features nor does it have any social monitoring, listening, or keyword searches. Influencer Search – CoSchedule does not have any influencer features. Clients Management Support – Crowdfire does not have these features. Social Engagement – Edgar does not have any type of social engagement or social monitoring features. Influencer Search – Edgar does not have any influencer features. Clients Management Support – Edgar has no features in this category. If you have a very specific need for a particular feature then you can definitely find exactly the tool that you would need. But if you are looking for a social media management platform that has all the features to boost your engagement, get more leads, and grow your business with powerful social media presence and engagement, then eClincher is the best tool for you.